Boiling Maple Sap in Iron Cauldrons. 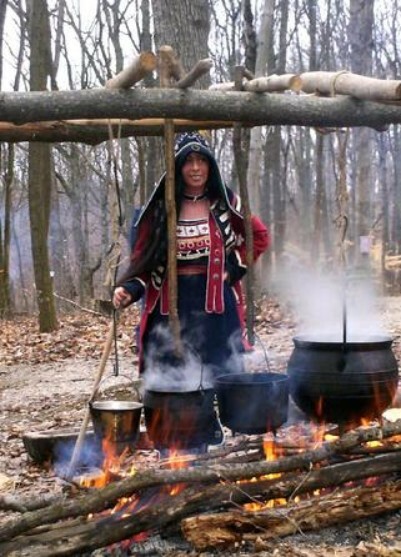 Towards the end of winter Ojibwa families began thinking of making maple syrup. They took special notice of the night time sky because in the old days time was measured by moons. The fourth moon, Ishkigamisegi Geezis, was the Moon of Boiling. By the time that the fourth moon was rising in the evening sky, the daytime sun had climbed high enough to warm the trees, so women packed dried meat and other food into rawhide or birchbark containers, men bundled fur blankets, woven mats, rawhide ropes and other life saving gadgets onto toboggans and kids got excited about the trip to the sugar bush camp. Each family set out for the part of the forest where they traditionally harvested the sap from the maple trees. The sugar maple, black maple and silver maple were used for syrup production but with varied results. The latter trees produced a somewhat cloudy syrup. Box elder (also known as Manitoba maple) and birch trees were also used to make a passable syrup but if available, it was the sugar maple tree that was preferred. A tree had to be at least 20 inches in diameter before it was tapped. Sap from larger trees that had developed lots of branches generally produced more plentiful and sweeter sap, especially when they had protection from the wind and good exposure to the sun. Nowadays when we think of making maple syrup we most often think of pancakes, but the Ojibwa didn't make pancakes because they didn't have flour. They used the syrup in other ways. Going to the trouble of making maple syrup had year round benefits. Stored in birchbark containers, it was used year round to flavour all sorts of foods...meat and fish, berries, harvested tubers and wild rice. Sometimes it was added at the end of cooking, but slices of meat might be dipped in the syrup and cooked directly over the fire to make a tasty glaze. The syrup or the maple sugar was also added to the cooking pot, or poured on top of the completed meal. Sap that had been allowed to sour was used to cook venison which was then sweetened with syrup in the last stages of cooking...the original sweet and sour recipe! The fresh sap could be used as it came from the tree or mixed with water as a drink. Both maple sugar and maple syrup were dissolved in water to make sweet drinks or added to teas that had been steeped from bark, leaves or roots. Fermented sap was used as an intoxicant...sometimes mixed with stewed berries. The Ojibwa didn't use the syrup itself for medicinal reasons, but had uses for other parts of the maple tree. A decoction of maple leaves was used as a wash to treat a severe itch. A compound infusion of bark and sap was used to treat sore eyes. An infusion of bark in a small amount of water was used as a cough syrup and an expectorant. An 1832 white man's remedy that included maple syrup as part of the recipe was reported to be a cure for cholera. This "old wives tale" suggested that a rub of lard, maple sugar and ashes from the maple tree, followed by a hot draught of maple sugar and lye would be beneficial to the cholera patient. The remedy was said to cause violent perspiration (no kidding!!!) which in the understanding of the day was like fighting poison with a stronger poison in the hope that it would bring about a cure. Remember...don't try it at home!